Agricultural expansion has been identified as a key driver of deforestation in developing countries. The IPCC estimated that carbon dioxide emissions, as a consequence of deforestation, amounted to 20% of all anthropogenically induced carbon dioxide emissions in the 1990s. Reducing Emissions from Deforestation and Forest Degradation in developing countries (REDD+), has been proclaimed an environmental policy instrument that could potentially provide mitigative benefits for net carbon emissions and biodiversity degradation. In the session entitled “What REDD+ looks like on the ground: evidence from the Amazon and beyond”, leading scientists addressed the relationship between biodiversity, carbon, forests and people, as well as experiences with the operationalization of REDD+ in Latin America. 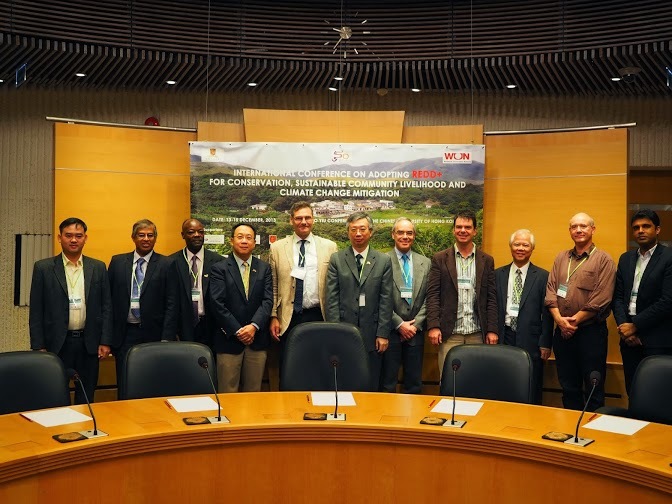 The Global Forest Expert Panel (GFEP), which is coordinated by IUFRO, presented a global assessment report on REDD+, which consolidates the research of more than 50 leading scientists. The report constitutes a comprehensive analysis of the synergies and trade-offs between biodiversity, forest management and REDD+. The assessment report proposes that biodiversity is paramount, as a prerequisite for providing ecosystem services. In the face of disturbance regimes such as climate change, ecosystem resilience, a product of biodiversity, ensures ecosystem service provision. Moreover, a successful REDD+ implementation, that achieves mitigative net carbon emissions and ensures biodiversity provision, requires, in conjuncture with the implementation, the pursuit of social objectives by securing tenure rights and local engagement. Only when tenure and property rights are clearly defined can a REDD+ implementation be effective. The session also included presentations on a global comparative study entitled “What REDD+ looks like on the ground: Carried out by CIFOR”. The study, which is t largest project ever undertaken by CIFOR, aims to provide scientific insights on how to ensure that REDD+ measures meet the three “E’s”; Effectiveness, Efficiency, Equity. As the first phase of the study has been completed, the findings of four cases were presented during the session. For more detailed information please visit the CIFOR webpage. Globally, great strides have been made in the last 20 years as to what constitutes responsible forest governance. Yet, frustrations exist at the scale and pace of change. In Latin America, there continues to be a notable gap between ‘rules on paper’ and ‘rules in use’ in most countries, and governance tends to remain firmly based in ‘command-and-control’ approaches established decades ago. In the session entitled “International Forest Governance and its influence on the convergence of forest policy in Latin America”, leading scholars in this field discussed what political science can do to improve international forest governance in the region through a mix of existing and emerging environmental policy instruments. Reported cases of “carbon cowboys” deriving indigenous communities from intended benefits from REDD+ have created mistrust and infighting and have raised questions about the usefulness of market-based approaches to environmental problems such as climate change. Yet, the political scientists concluded that – if well designed – market-based instruments such as forest certification or payments for environmental services can help deliver effective policy outcomes. Costa Rica can be cited as a positive example on how new forms and modes of governance have successfully been incorporate into forest policy. The session also discussed the newly emerging discourse on “rights of nature” in which nature is treated as a ‘subject’ rather than an ‘object’ in environmental legislation. While the notion of collective property rights reflected in this new approach can be seen as a more ethical approach to natural resources, it may however also be motivated by more mundane considerations, such as the intention to bargain for increased financial support from the international community. Overall, the examples presented in the session indicated the need to incorporate new forms and modes of governance into forest and environmental policy in Latin America. If well-designed, instruments such as legality verification can help form large coalitions of actors and can trigger a “ratchet up” towards better forestry standards in the region. Forests harbour a major proportion of the world’s terrestrial biodiversity and provide a wide range of vitally important ecosystem services – including carbon sequestration and storage. Deforestation and forest degradation continue to erode biodiversity and the capacity of forest ecosystems to help mitigate climate change and provide the goods and services that sustain livelihoods and human well-being locally, and globally. Reducing greenhouse gas emissions from deforestation and forest degradation, and enhancing forest carbon stocks in developing countries (REDD+) is a proposed mechanism which has the potential to realise its primary objective – climate change mitigation – with variable impacts, positive and negative, on biodiversity, forests and people. REDD+ is complex, its proposed activities and implementation mechanisms not yet clearly defined, and therefore surrounded by uncertainty. Because of its high relevance to climate change mitigation, the conservation and sustainable use of forests and their biological diversity, the Expert Panel on Biodiversity, Forest Management and REDD+ was established by the Collaborative Partnership on Forests in December 2011 to carry out this assessment. The Expert Panel included 24 scientists and other experts from a variety of biophysical and social science disciplines relevant to the topics covered in this assessment report. An additional 18 contributing authors added their expertise to the assessment. Each chapter was prepared by a team of Lead Authors and Contributing Authors led by one or more Coordinating Lead Authors. A full draft of the report and its individual chapters was peer-reviewed prior to its completion. The results of this voluntary collaboration between January and October 2012 are presented in the six inter-related chapters comprising this book. This assessment report evaluates the implications of forest and land management interventions envisaged under REDD+ in a multidimensional and integrated fashion. It summarises the most current scientific literature that sheds light on the relationships between forest biodiversity and carbon (and other ecosystem services), how these complex relationships may be affected by management activities implemented to achieve REDD+ objectives, the potential synergies and tradeoffs between and among environmental and socio-economic objectives, and their relationship to governance issues. Based on the main findings of the assessment (summarised in Chapter 6), a policy brief entitled ‘REDD+, Biodiversity and People: Opportunities and Risks’ has been prepared especially for policy- and decision-makers. The full report is formally presented at Forest Day 6 on 2 December during the United Nations Framework Convention on Climate Change (UNFCCC) meeting in Doha, Qatar (26 November-7 December, 2012). The report, the policy brief and a press release – New Study Suggests Global Pacts Like REDD Ignore Primary Causes of Destruction of Forests – are available for download.